Hello everyone! I'm Leslie, and I will be the Guest Designer for The Rubber Cafe's April KOTM. A big shout out to all the wonderful ladies at The Rubber Café, everyone is so fun and talented! Thank you for letting this newbie blogger into your creative space. 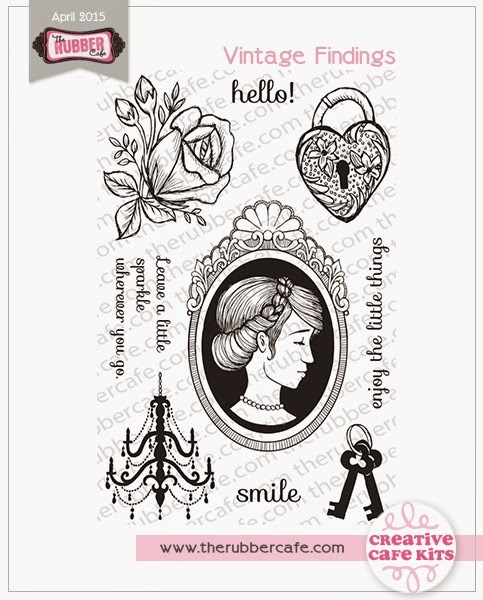 My mother has a large cameo that belonged to my grandmother, and when I saw the large stamp in this month's Vintage Findings collection, it reminded me of a cameo. I wanted to try to recreate that transparency that cameos have. Speaking of dear mother, Mother's Day is not that far away and it is time to start thinking of how we can make that day special. 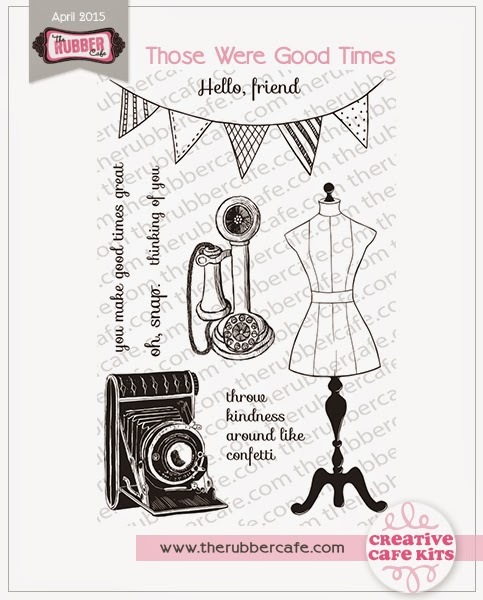 I think this card would make a lovely Mum's day card! The Cameo: I started my project by stamping the 'cameo' piece (as I am calling it) in Versamark ink. I actually stamped it twice because I wanted a different effect on the frame than on the face. 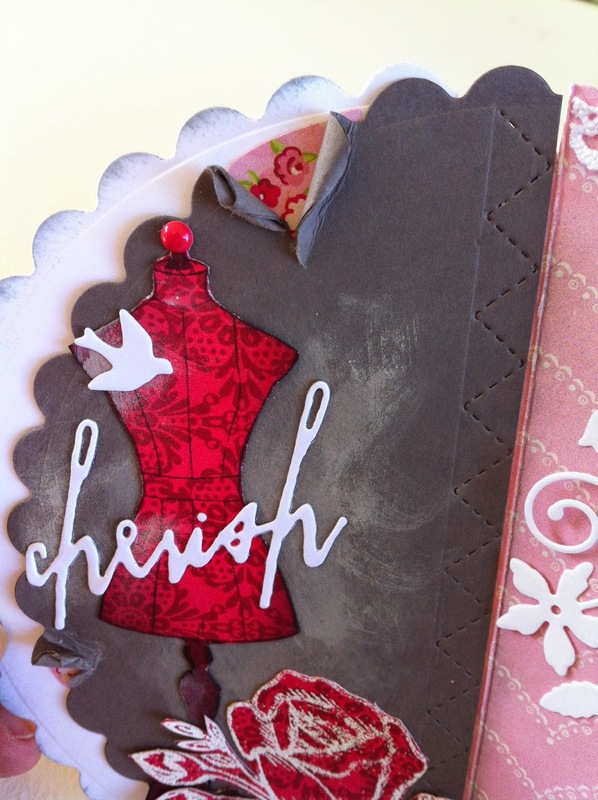 The first time I stamped it on the dark gray 81/2" paper in the kit and embossed it with shabby white embossing powder. This powder has large chunks and some glitter in it, so it provides a rougher emboss. Next, I stamped the image in Versamark again, on a scrap of vellum paper. This time I embossed the image in a fine white embossing powder. To assemble the complete image, I used a standard small oval Spellbinder die to cut out the center oval of the gray 'frame' piece. Now I had a lovely jewelry like frame for the cameo image. I then cut the oval face from the vellum piece - leaving enough edge on the oval to glue it to the back of the frame. This makes a lovely combination of textures and vellum provides the transparency of true cameo. It is embellished with dark pink enamel dots from the kit. This card is a creative design that allows you to fold it flat for mailing (in a 6x6 envelope), yet when open it stands on it's own and has an impressive expansion. 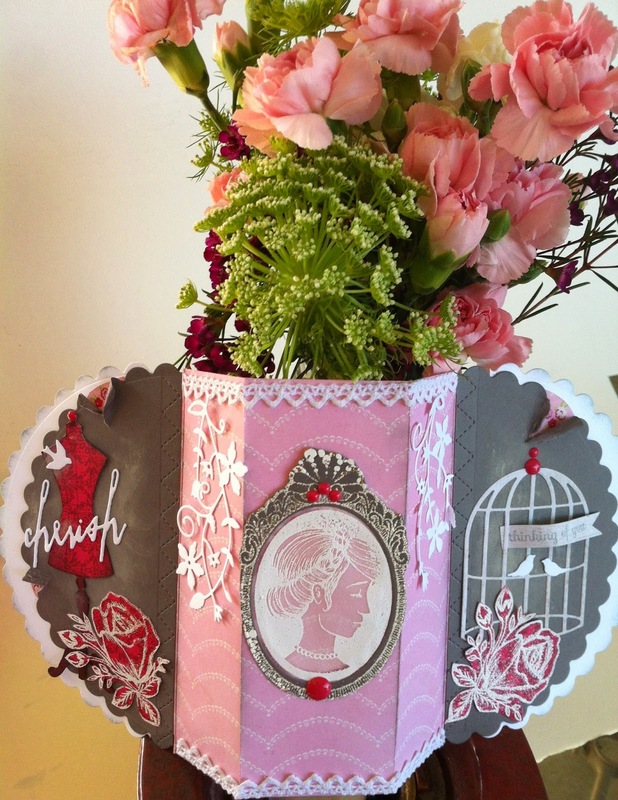 This is done by creating a center piece, and adding 'wings' that fold under the main piece when mailing. The Side wings: I have a large scalloped die that is 5 1/2 in diameter. I cut two half circles in gray and two in white using the paper from the kit. I glued the gray half circles to the half-inch tabs of the Center piece so that the tabs are in the back. I only placed my glue on the tab. 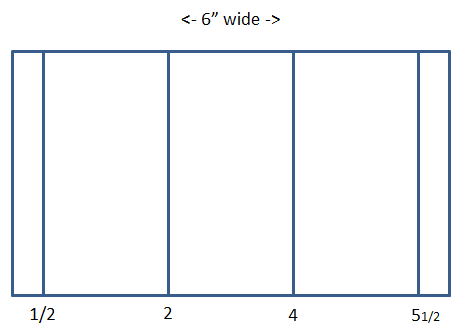 As you can see in the diagram - you may need to trim the tab a little so that it doesn't show above your wing. Then flip the piece over and attach the second set of wings, butting the edge up next to the tab. Note when adding this second wing I glued only up the middle of the circle - this leaves the edges free for tearing during the embellishment stage. Embellishments - left side: Here I stamped the large dress form image from the add-on stamp set for the kit - Those Were Good Times. It is stamped in black ink on red paper from the kit . I stamped the rose two times from the Vintage Findings stamp set on the same red paper in Versamark ink and used white embossing powder. I then fussy cut all three images, saving one rose for the right side. Embellishments - right side. 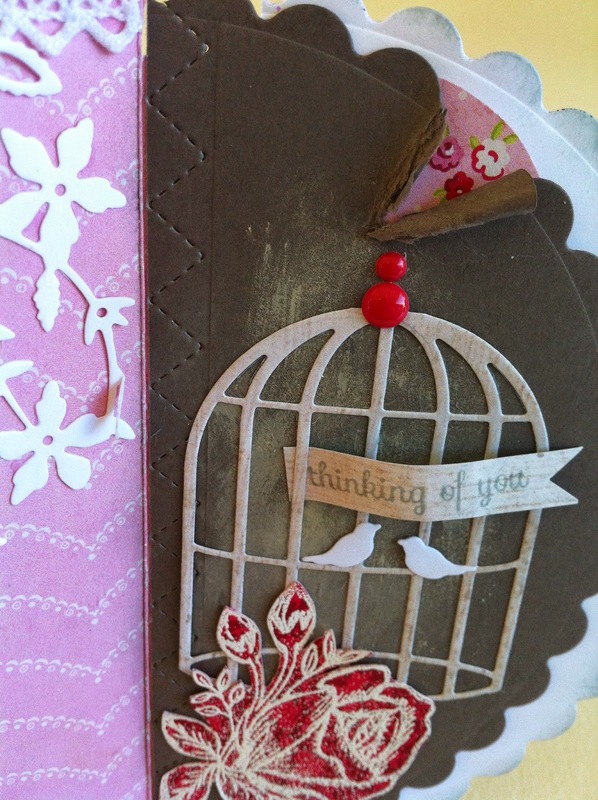 I die cut a birdcage from the worn beige paper in the kit and two more white birds. I stamped the 'thinking of you' from the add-on stamp set on the same worn beige paper in gray ink. I then cut it out in a flag shape and gave it a little form by shaping it over my paint brush. Once again, before adding the die cuts, dry-brush ivory paint behind the area where the birdcage will be placed. Add your second fussy cut rose and do some more tears on this side. More enamel dots were used on the birdcage. 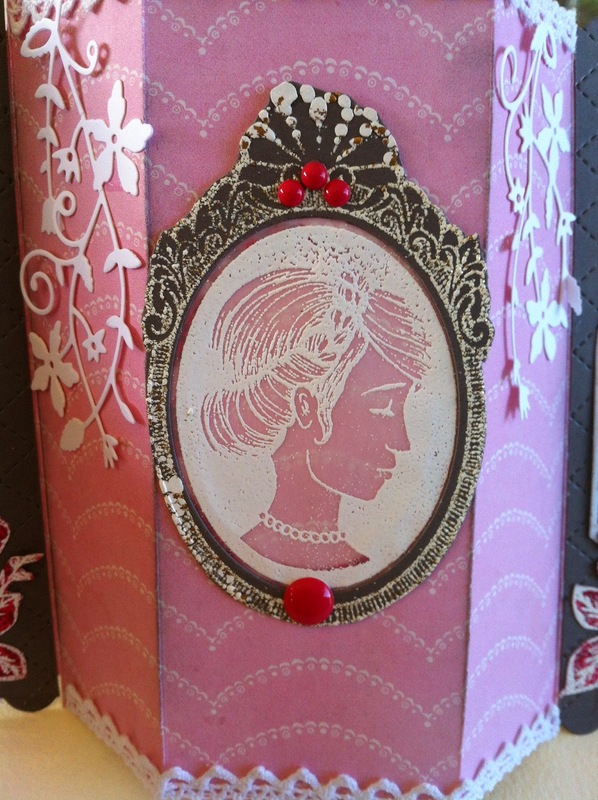 Embellishments - center piece: Add your cameo to the front panel, add white lace from the kit and embellish with white floral die cuts on the two side pieces of the center panel. Here is a photo of the card closed with the wings folded in the back and ready for mailing. Hope you have fun adding WINGS to your own cards! Until next time!